Revolutionary Design - 9 (that’s right - nine!) strands of MultiTuf PE fibers specially wrapped for outstanding casting distance and abrasion resistance. Reverse Spiral Winding Technology - KastKing SuperKast9 is reverse wound so there are no gaps between the wraps! 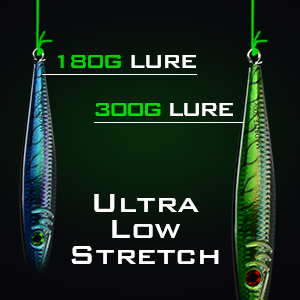 Less friction and drag through the fishing rod guides than any other braided fishing line. 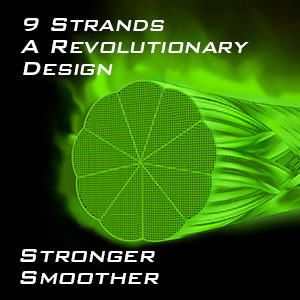 Superior Castability - 9 strands make the SuperKast9 perfectly ROUND! And our innovative manufacturing technique provides the smoothest finish that offers you fantastic casting distance. Tie knots easier. 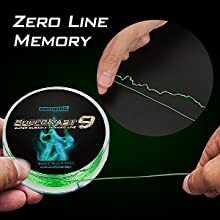 Tougher - Laboratory tests showed SuperKast9 braided fishing line had substantial wear resistance compared to other fishing line brands. Perfect for fishing around vegetation and hard structure. Professional Endorsement - Tested and approved by professional fishing guides and charter captains, plus nearly 50 members of the Team Eposeidon Pro Staff. As an extra benefit to our environment, KastKing SuperKast9 braid is spooled on our award winning, KastKing® BioSpools which are made with wheat stray waste products and will replace traditional hard plastic spools. KastKing® BioSpools are compostable and will deteriorate in soil in eight to twelve months. 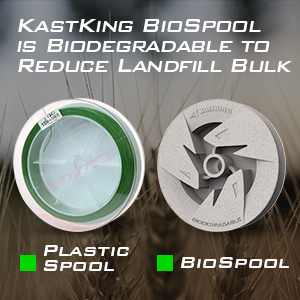 KastKing biospool is biodegradable to reduce landfill bulk. 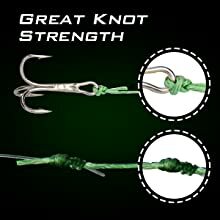 Dynamically incorporated strands in KastKing SuperKast9 allows you to easily tie a more solid knot; you can even tie an improved clinch knot. KastKing9 braided lines feature incredible abrasion resistance for less breakoffs when fishing around heavy cover and hard structure. 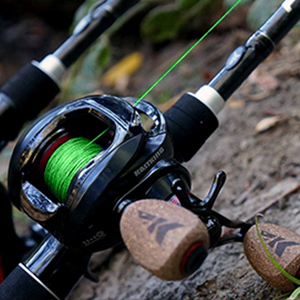 The zero line memory helps you achieve a better, farther casts, less chance of wind knots. 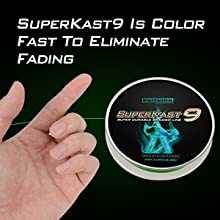 KastKing SuperKast9 offers you fantastic casting distance. SuperKast9 technology takes fishing with braided lines a step further. 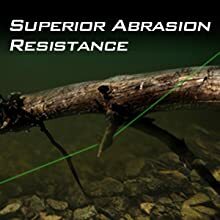 An innovative process creates tighter, cleaner wraps without gaps between the wraps, resulting in a braid fishing line that is smoother, rounder, and easily slides through rod guides and over rough surfaces. SuperKast9 9 fiber carriers are wound together in a reverse spiral instead of the traditional “braiding and knotting”as done in ‘regular’braid. Excellent line.However i m perplexed at how the price has doubled in a matter of weeks. Any plans to move manufacturing of this line to the USA?